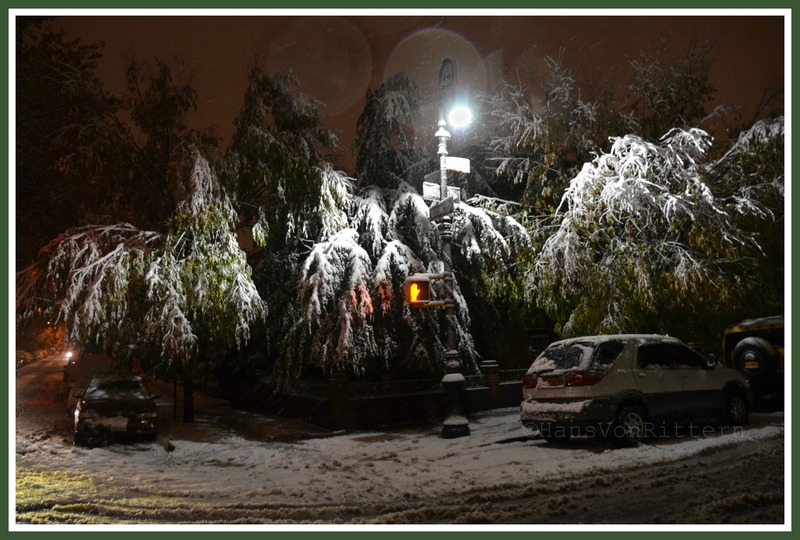 We have such a dense canopy of trees in Sunnyside, the weight of the heavy wet snow made for an eerie yet beautifully dramatic walk that night as they bowed dangerously low. Silent night, snowy night. All wasn’t calm, but it was quite a sight. Today November 8, 2013 it will thankfully be 54°. This entry was posted on November 8, 2013 by newyorkcityinthewitofaneye. It was filed under DAILY PHOTOS WITH STORIES OF NEW YORK CITY and was tagged with earliest heavy snowfall in New York, global warming, Hans Von Rittern, Hurricane Sandy, New York City, New York photo, night snowfall scene, November 8 2012 snowstorm, odd weather, Photo of the day, pine trees in snow, Queens, Sunnyside, Sunnyside Gardens, typhoon Philippines.